Apologies for the late posting this week. As always, please bring a copy of the route. If any members would like to propose some new routes, please feel free to send them in via the contact us form on the website. We are always looking to mix things up a bit. Meet at the Rose and Crown at 10 am for a sociable cycle ride out for tea and cake, and back to the pub for more tea (or beer). Pace set by the slowest rider. Except this is The Tea Ride…. it’s called the wrong clothing, not the wrong weather! Whatever the weather, all year round, 10am, the Rose and Crown, Ivinghoe. As for The Beach Boys, we’ll just leave them at home by the fireside whilst we go out and play in the puddles….. In celebration of the highly enjoyable Stage 6 of this years Tour of Britain, which took in a good few of our local roads, this week we have a specially designed route from Dave “The Hill” Howe. He starts off by taking us on a gentle journey to Chinnor at which point … well, let’s just say it gets a bit ‘lumpy’. As it is a longish ride we will start a bit early but we will still have a more standard route for those who want to begin at the usual time of day. This Saturday sees the annual Ride & Stride in aid of our local, historic churches. It’s free to take part but they ask that you raise a little sponsorship if you can (or make a donation). As ever, marvellous Mary has planned us a route. Most of the churches will provide a drink and some of them have eats as well. The ride might therefore take a little bit longer than is usual for a tea ride. Leave Ivinghoe 10.00 as sharp as poss! At this point Tea Riders wanting to make their way home can head off, down Wing Park hill to the crossroads and then left to Ledburn, take the next right, then the next left, go under Bridego Bridge and then turn right at the T-junction, heading back home through Great Gap and up into Ivinghoe. Those wishing to do the Full Mary can continue with her, off to Mursley, Stewkley, Mentmore, Slapton, Cheddington and home. Details of how to donate can be found here, on the Historic Churches Trust website. Please assemble at the Rose and Crown by 10am for a prompt departure – Mary is in charge! The Tuesday ride this week is a familiar route with an easy bale out point after Slapton if people want to keep it short. We depart from Pitstone roundabout at 6:30pm (sharp). Lights would be a good idea. 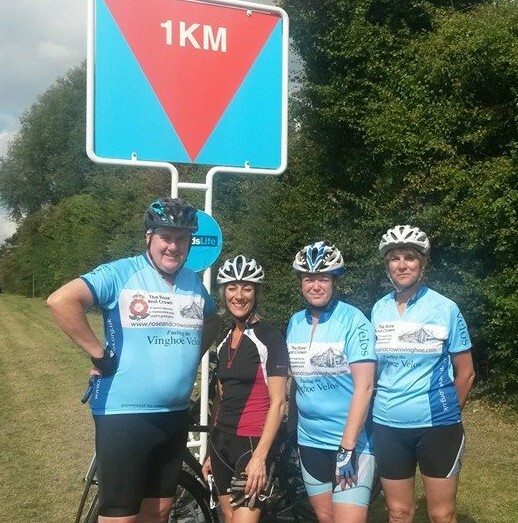 Many of our group are planning to ride the The Soldiers Charity Ride from Stanbridge and Sarah Wilson has suggested that any doing the 26 mile route might like to meet up at Pitstone roundabout to ride over there together. She is departing at 9am. I am afraid that the links may need to be copy and pasted to your browser as the latest upgrade of our website has killed a few essential features ! I’m in with the in crowd…. And there’s no in crowd better than the Tea Ride crowd. Any time of year? Yep, but always 10am on a Saturday at the Rose & Crown. Be there or be somewhere square. Mr Dave “Fast and Flat” Bembridge has provided the route for Tuesday evening. We meet at Pitstone roundabout with a depart time of 6:30pm. If you fancy the pub afterwards it would probably be best to bring a set of lights as the nights, they are a closin’ in.